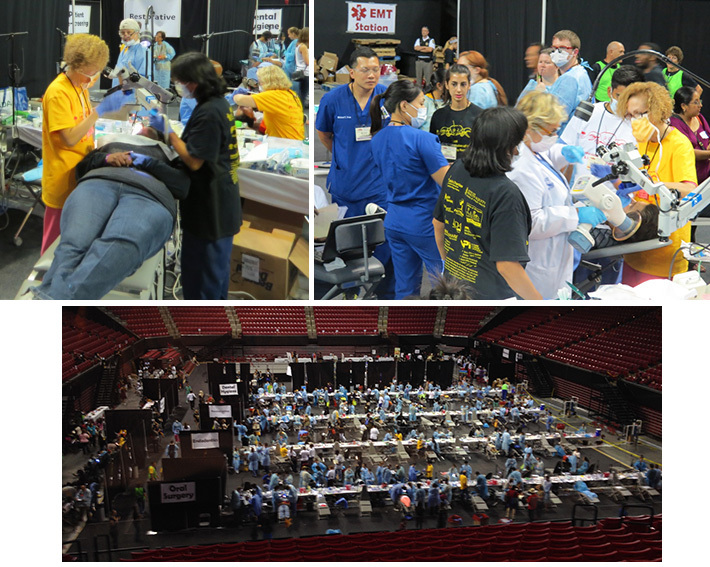 The DCDS Foundation sponsors a booth where Dr. Angela Noguera and her husband, Dr. Ali Fassihi volunteered performing free oral cancer screenings. 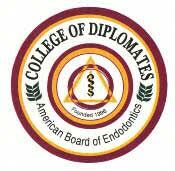 Dr. Noguera is a board member of the DCDS Foundation, which is dedicated to providing oral health care and education throughout the community. Dr. Stephen Guttenberg and Dr. Angela Noguera performing an oral exam. 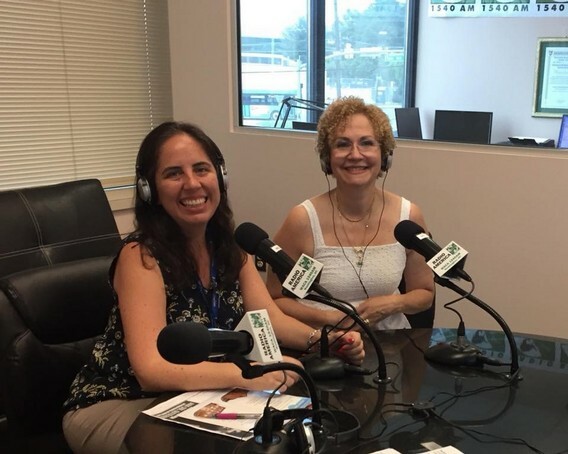 Dr. Lucciola Lambruschini, Director of Dental Services, Catholic Charities and Dr. Angela Noguera. Dr. Noguera was the guest of Catholic Charities on Radio America 1540 AM. On this program, they strive to educate the Spanish speaking community regarding education, health and housing services available. Dr. Noguera participated in a discussion about dental infections, oral health and hygiene. Great day at the ADA, Mission of Mercy (MOM) ! 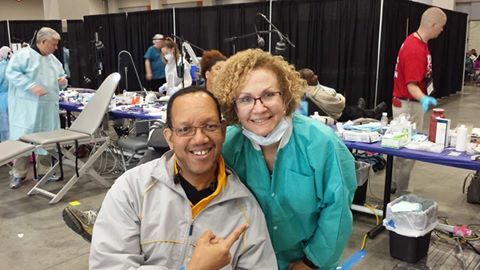 Here I am with one of my patients, to whom we were able to do a much needed root canal in his front tooth, as well as bleach a very discolored central. Needless to say, he was thrilled, as the bleaching was just the "icing on the cake." He insisted on a selfie for his wife. With us is Rosemary, who assisted my for the day. She is a 3rd year dental student at Howard University. 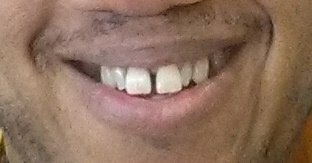 It was a great team effort.......This is when I feel so happy to be a dentist and an endodontist......It is all about the twinkle in their eyes and the great smile, when treatment is done! Thanks Pete for the pictures! 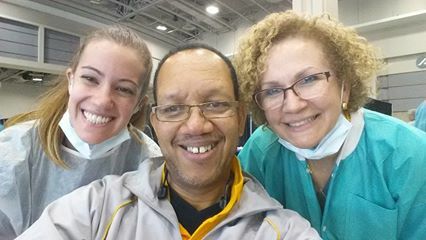 Dr.Noguera voluntering at the Health & Fitness Expo providing free oral health screenings at the DC Dental Society Foundation booth. Over 1000 patients received free oral cancer screenings and among them, one in particular who's last check up was about 150 years ago. 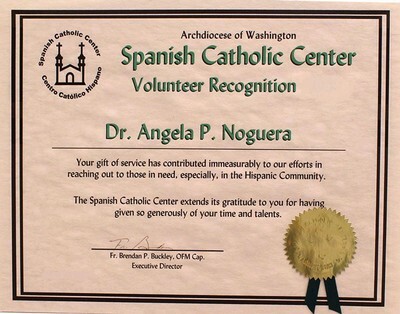 Dr. Angela P. Noguera has been a dedicated volunteer for the Spanish Catholic Center dental clinic since 1989. She has performed hundreds of perfect root canal treatments for our patients in that time. She has a dedicated interest and concern for each low income, uninsured immigrant who passes through her dental office and follows-up to make sure that their care continues. Dr. Noguera is a role model for all those she meets and treats by her professionalism and kind, gentle manner. 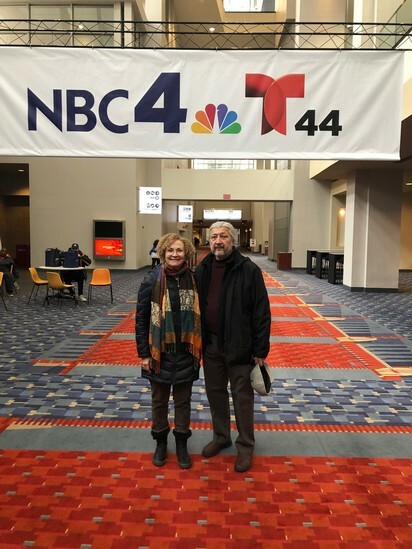 As a friend of the Spanish Catholic Center she always been supportive of our activities and has served on Committees and Boards, the most current being the Latino Advisory Committee of the Catholic Charities Board of Directors. We are grateful for our long relationship with Dr. Noguera and pray that God will grant every blessing to her, her family and her practice for many years to come.